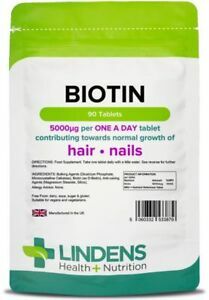 Biotin (which is also known as Vitamin B) is good for developing healthy hair, nails, and skin, and this jar contains 90 x 50mg capsules of biotin supplement. Vegetarian, sugar-free, tree nut-free, and lactose-free, this supplement has Vitamin D as one of its active ingredients. Swallow the recommended dose of capsules with a drink, and always consult a medical professional before beginning any kind of supplemental regime. Er zijn 97.944 objecten beschikbaar. Voer een getal in dat minder is dan of gelijk is aan 97.944.